WASHINGTON (AP) — The Trump administration’s back-to-back controversies over its Russian ties now have at least one thing in common: Ambassador Sergey Kislyak. Moscow’s top diplomat is a Washington fixture with a sprawling network, and he has emerged as the central figure in the investigations into Trump advisers’ connections with Russia. In a matter of weeks, contact with Kislyak led to the firing of a top adviser to the president and, on Thursday, prompted calls for the Attorney General Jeff Sessions to resign. Separately, a White House official confirmed that Trump’s son-in-law Jared Kushner and ousted national security adviser Michael Flynn met with Kislyak at Trump Tower in December for what the official called a brief courtesy meeting. Flynn was pushed out of the White House last month after officials said he misled Vice President Mike Pence about whether he and the ambassador had discussed U.S. sanctions against Russia in a phone call. At issue Thursday were two meetings between Sessions and Kislyak — one in July and another in September, at the height of concern over Russia’s involvement in the hacking of Democratic officials’ emails accounts. Intelligence officials have since concluded that Moscow ordered the hacks to tilt the election toward Trump. During his confirmation hearing, the Alabama Republican denied having had contact with any Russian officials, neglecting to mention the meetings with Kislyak, which were first reported by The Washington Post. The Russian Embassy did not respond to a request for comment. Although the White House dismissed the revelation as part of a political witch hunt, Sessions’ former colleagues took the omission seriously. At the urging of some in his own party, Sessions recused himself from the Department of Justice’s investigation. Still, Democrats called on him to step down. Observers note Kislyak is a somewhat unlikely figure to cause controversy. Over the course of a long diplomatic career, he’s led the life of a fairly typical global envoy, making himself a reliable presence on the circuit of receptions, teas and forums that make up the calendar of any ambassador. Kislyak, who was appointed to his post in 2008, is regularly spotted walking around town, heading to and from meetings. Early in his tenure, he often opened the doors of the Russian Embassy, hosting dinners for foreign policy professionals, Pentagon officials, journalists and Capitol Hill staffers. Those who have attended the events describe him as a gracious and amiable diplomat, although perhaps not as polished — or as confrontational — as his more famous boss, Foreign Minister Sergey Lavrov. In 2015, when Kislyak invited a group of Washington-based journalists, including one from The Associated Press, to the Russian Embassy for tea, he used the meeting to push warmer relations between the two nations, despite the conflict over Russia’s seizure of Crimea and the crisis in Ukraine. Kislyak framed U.S.-Russian relations as salvageable and said he hoped specifically to combat what he considered cartoonish, anti-Russian depictions of his government in the American news media. Sessions, at a news conference where he recused himself from the investigation into the Trump campaign’s ties with Russia, said he discussed a number of things with Kislyak, including counterterrorism. He said the meeting became confrontational when the talk turned to Ukraine. 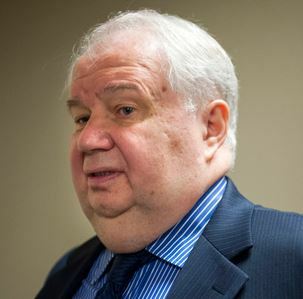 Kislyak, 66, has bounced between the United States and Russia for most of his long career. His first foreign posting was to New York where he worked at the Soviet delegation at the United Nations in the early 1980s. He spent the following years as the first secretary and then councilor at the Soviet Embassy in Washington before returning to Moscow in 1989, where he took a succession of senior jobs at the Foreign Ministry. He did a stint as Russian ambassador to Belgium and simultaneously served as Moscow’s envoy at NATO. He then returned to Moscow to serve as a deputy foreign minister, overseeing relations with the United States and arms control issues before being sent to Washington. Kislyak’s contacts have sparked questions about his role or involvement in the hacking, questions that are difficult to answer. The U.S. and Russia, along with many other countries, have made it a practice to separate their top diplomats from espionage activities, although it is not uncommon for an intelligence agent to operate under the cover of a senior-level diplomat job. Foreign diplomats to the United States likely expect that their activities will be monitored by U.S. authorities in the same manner that American diplomats are monitored in countries like Russia. Russian ambassadors most likely are aware of the intelligence agents operating under diplomatic cover, but are not believed to part of the security services themselves. Russian Foreign Ministry spokeswoman Maria Zakharova on Thursday ridiculed the claims of Kislyak’s involvement in espionage as “total disinformation” and part of efforts to sway public opinion. Isachenkov reported from Moscow. Associated Press writers Bradley Klapper and Matthew Lee in Washington contributed to this report.